Planning real estate income with the funnel approach involves determining how much needs to be fed into the top of the funnel in the way of prospects to generate the desired number of transactions exiting the bottom of the funnel. It also requires an analysis of current activities and marketing to feed the required amount of prospects into the top of the funnel. The task is complicated by the difference in the quality of prospects based on how they are acquired or generated and where they are in the process. In other words, a prospect who calls you and requests to be shown realty properties is more likely to come out the bottom of the funnel as a transaction than one who just visited your website and asked for information. You also need to quantify an "average" transaction and commission amount for each transaction that exits the bottom of the funnel. This way you can come up with what you need to feed at the top to realize income goals from what comes out the bottom. Determine Funnel-Out for Funnel-In for Each Type of Prospect. 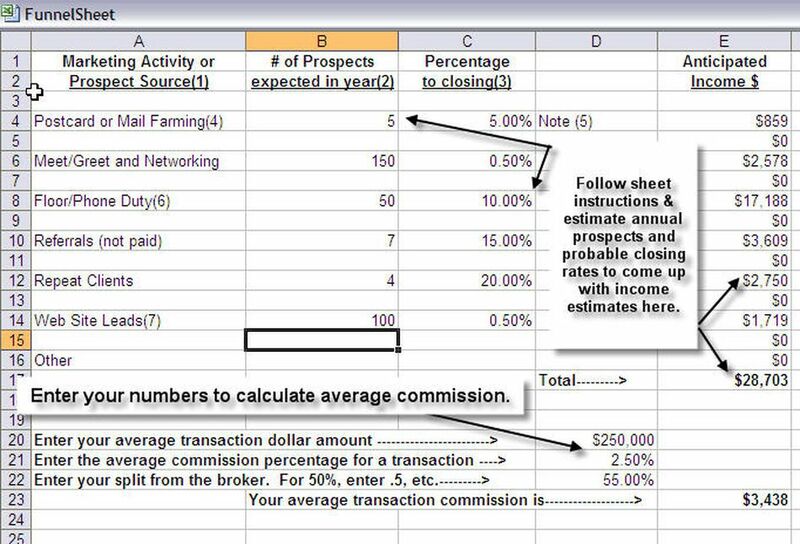 Implementing a spreadsheet to determine your average per-transaction commission income can be done by entering the average transaction percentage, your split percentage, and the average sale dollar amount for a transaction. You can see the examples in the image. Simply replace the sample numbers with your own. As internet leads are now the norm for many real estate professionals, you should be developing two different funnel systems, one for traditional leads and the other for website leads. They behave differently and have different timelines. Web leads often must be worked for months, as the internet lets our prospects start much earlier and stay anonymous in their search for real estate services. Examine prospect types and try to determine the percentage of the type of prospect who is likely to come out the bottom of the funnel as a transaction. Then you will know how many you need to enter the funnel to achieve your income goals. For example, take newspaper ad call-ins that look at properties. You're on floor duty and get a call from someone who wants to look at a company listing. You set an appointment and show that listing and some that are similar from the multiple listing service (MLS). What you want to conservatively quantify is how many of this type of prospect might end up buying through you. It tends to be very subjective and somewhat arbitrary, but if you err on the conservative side, you'll probably be quite happy with the results. Use one in 20 to be conservative. You'll likely find you get about 50 of these a year when you're on floor duty. Estimate closings for each type of marketing or prospect listed in the spreadsheet. Change descriptions or add blank lines as needed. Once you've determined the anticipated number of transactions you'll have from a certain type of prospect; you can apply that to your average transaction commission income amount to see how far you've progressed toward your desired annual income total. The spreadsheet does this for you and totals the result. If there isn't enough to make ends meet, you might need to take other agent's floor duty or increase activity in other areas. The overall goal here is to understand where you're getting leads, how many you're getting from each source, the percentage of each source's leads that make it to closing, and the money spent in getting those deals. Incorporate these tools and information into your marketing plan in the future to know where best to spend your money and time. Continue refining and testing your marketing and tracking results, and then you will have the information needed to gain more commission dollars for every dollar you spend in lead generation marketing.